There comes a moment in some research projects where a realization hits that what you set out to do may, in fact, be quite impossible. On a spring day in 2014, this moment came precisely when my research team and I joined up with the North Carolina State Parks inventory biologist, Ed Corey, to learn how to identify the snails we hoped to collect. There we were in the Eno River in central North Carolina, chest waders donned and carefully making our way to the bubbling riffles. Ed found a snail of the species we were looking for—the panhandle pebblesnail (with the Latin scientific moniker, Somatogyrus virginicus). One look, and I thought, “you’ve got to be kidding me.” It was the size of a peppercorn! Adults tend to average a maximum shell length of 4–5 millimeters. In this swift flowing river amongst the boulders, we were looking for peppercorns and we needed a few hundred of them! Okay, a good field biologist doesn’t panic. I asked Ed how many snails he usually finds when he surveys this stretch of stream. His answer was not encouraging. Because his job is to inventory all the species in all the state parks across North Carolina, Ed doesn’t have the luxury of time to systematically account for the abundance of plants and animals he comes across. He uses a strategy of presence surveys; if a species is observed, it’s marked as present in a park, and then Ed moves on to find others. Because of this, Ed’s answer to my inquiry about abundance essentially was that he had no idea how many might be in this section of river. Why were we looking for these nearly microscopic snails, and why did we need so many of them anyway? Panhandle pebblesnails are a rare freshwater species with patchy populations sprinkled sporadically in just a few river basins in the southeastern U.S. Because they are designated as a Species of Greatest Conservation Need in the North Carolina Wildlife Action Plan, and this small population was facing the threat of an invader that could destroy its habitat, we had to step in to help. 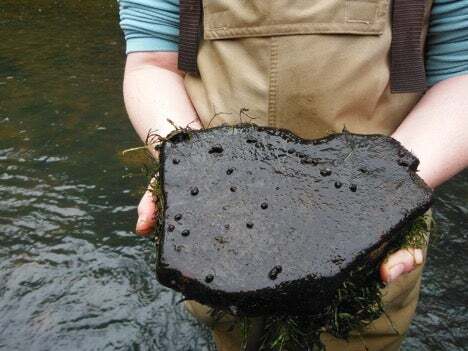 These and other snails are grazers—important consumers of algae and other microorganisms—so they are integral to maintaining the ecological balance in river systems. But managing an invader for the benefit of the native species in the river, including the panhandle pebblesnail was no simple task. In fact, it was quite a complex problem. The invasive culprit was an aquatic plant called hydrilla (Hydrilla verticillata). Sometimes called water thyme, hydrilla is a leafy plant that takes root in the sediment, reaches a long stalk toward the sunlight as it grows, and forms extremely dense stands of aquatic vegetation, eventually topping out at the water’s surface; imagine trying to paddle a canoe across your carpet. It was introduced to the U.S. through the aquarium trade in the 1950s. Its invasion began in ponds and canals of Florida and it has slowly worked its way into many southern states and beyond, such that it has earned a place on the infamous Federal Noxious Weeds list. Unfortunately, humans tend to be hydrilla’s greatest ally in spreading because it can easily establish in new habitats from just a fragment of its former self; plant fragments often end up on boat motors and trailers, fishing equipment or wading boots. This propensity to propagate from small fragments also makes removal difficult. In efforts to hand-remove hydrilla from newly invaded habitats, well-meaning humans have sometimes made the problem worse. As it gets raked and pulled, small pieces break off and can take root in another part of the water body or float down a canal or stream and establish itself in a new area. Hydrilla could be a serious problem for our tiny snail buddies. The panhandle pebblesnail needs clean, clear streams with swift-flowing water. Indeed, even within swift-flowing riffles, these snails often choose the fastest water available. Hydrilla’s dense growth can slow stream flow. The snails need very clean rocks to live and to lay their eggs. By snail standards, their tiny foot is very strong, but they must have a clean surface to maintain their grip and avoid getting washed away. By slowing stream flow, hydrilla allows sediment to settle from the water column in areas it otherwise would not. Trying to control hydrilla in the river poses its own set of problems. As mentioned before, for most of its U.S. history, hydrilla has been confined to lakes or slow-moving canals with very little native vegetation. We’ve already seen that hand removal is not a good option. Introducing yet another species—grass carp—can be another means of control, since they will eat the hydrilla. Unfortunately, they will also eat native plants after hydrilla dies back in the fall, so carp are not the answer in habitats with abundant native plants. The last control method, which is often selected for its effectiveness, is the application of herbicides designed for use in aquatic environments. Herbicide seemed like the most tenable option here, but there were two major hurdles. First, engineers had to grapple with how to apply it in a flowing stream: they needed to keep the concentration high enough to kill hydrilla for 60–90 days while accounting for changes in flow from rain or drought, and not killing riffleweed (Podostemum ceratophyllum)—a native plant that is the snail's preferred habitat. Second, and of great potential consequence to the panhandle pebblesnail, there was no information on how these herbicides might affect freshwater mollusks and other sensitive species in the river. This second hurdle to eradicating hydrilla is what brought me to the middle of the Eno River, staring at the tiny adult snail on my hand and pondering how on Earth we would manage to find nearly 200 of them. I wondered if what we hoped to accomplish that day might take many days, and how we might be able to keep these river lovers happy and healthy in the lab. In order to determine whether the aquatic herbicides would be safe to use, we needed to collect enough to test their sensitivity in a rigorous, laboratory experiment, complete with replication of multiple herbicide concentrations, but first we had to attempt a small pilot study to see if such experiments were even feasible with these snails. We gradually figured out how to spot the snails. They were absent on some rocks, while others seemed to contain the mother lode. With a handful of volunteers, we managed to collect enough and head back to the lab to find out how the herbicide might affect them. With my cargo safely back at the lab, I went through the familiar steps of setting up an environmental toxicology experiment. Though there is no protocol for conducted experiments with freshwater gastropods, I followed the guidelines developed for freshwater mussels. Snails are much different from bivalve mussels, so part of the pilot study was to work out how to assess their survival. As it turned out, they are quite active when healthy and I was able to view subtle movement through low-powered microscopes. The pilot study was a success, and though we had a small amount of data, the results were encouraging: first, we could successfully run an experiment with these snails and determine their survival. Second, it seemed like the snails weren’t especially sensitive to the herbicide we tested. During the summer, the Eno River Hydrilla Management Task Force finalized a plan for applying herbicide. Now, natural resource managers needed us to conduct a full-scale experiment to ensure the plan was safe for the panhandle pebblesnails. Later that summer, we headed back to the Eno, confident in our abilities to gather up some panhandle pebblesnails. But they appeared to be gone! What happened? They were here before and now nothing! WHERE HAVE ALL THE SNAILS GONE? Back to the drawing board. My advisor and I had expertise in freshwater mollusks, but our flavor to this point had been of the mussel variety. Snails were a fresh challenge for our lab, and in fact, very few people around the country study freshwater snails, never mind, freshwater snail toxicology. We were truly sailing in uncharted territory. We called one of the few freshwater snail experts we knew, thanks to a close-knit network of freshwater malacologists around the country. Paul Johnson, at the Alabama Aquatic Biodiversity Center, informed us that we were dealing with an annual species. That didn’t just mean that they have an annual reproductive cycle and breed once per year. It meant that after breeding, the adults die! They live for a season, mate, lay eggs when the water temperature is optimal, and then the entire adult population perishes. Before I knew it, we were in the middle of the most complex natural resource management scenario that I had been privy to. Hydrilla threatened pebblesnail habitat. Applying herbicides to control hydrilla had to happen in the late spring and throughout summer while it was growing. This timing coincided with the mating, egg laying, development and hatching of new baby snails. And the existence of the snail population was riding on the survival of these hatchlings because the whole adult population would self-destruct after mating! This self-destruct mode explained why we failed to find any panhandle pebblesnails on our June trip to the river. As Paul advised, we tried again later in the season, only now we knew we’d be looking for juvenile snails. Recall the “huge” adults are about as big as a peppercorn. Now we’d be looking for poppy seeds. In a river. In fast water. On rocks covered with the riffleweed plant they loved to hide in. Oy! We returned to the river in August. Finding the juvenile snails was difficult at first, but find them we did. And when we lifted a rock that they loved, I could merely plant my hand on the riffleweed and lift it to see a half dozen babies stuck to my hand. The juveniles turned out to be sensitive to the herbicide compared to other species, but the good news was that their sensitivity was approximately 100 times higher than the levels needed to control hydrilla. That offered a comfortable margin of safety. While our findings from the juvenile snail experiment was encouraging, we still had to contend with determining whether herbicides would be safe for eggs and their development into hatchlings. It was time to consult Paul Johnson again. He raised related snails for conservation reintroduction in his outdoor facility in Alabama. If anyone could tell us whether getting adults to lay eggs in the lab was feasible, it would be Paul. I noticed the year before that some of the adults in the lab laid eggs in the glass dishes and on each other’s shells, so I was hopeful they would reproduce in the lab. But we still needed to maintain experimental power and rigor—that is, enough isolated treatments and replicates to ensure we could trust our data. Whereas Paul’s snails were free to lay their eggs in kiddie pools on bricks or terra-cotta tiles, we needed a system that would allow many groups of snails, each group in their own beaker to mate and lay eggs on a small substrate that we could then randomly assign to experimental treatments. We ended up with one of Paul’s suggestions—five-by-eight–centimeter pieces of vinyl siding (yes, the kind on homes)—and the details worked out themselves out. It was now April 2015. The Eno River Hydrilla Management Task Force had herbicide funding and a contract in place, and they were ready to go ahead with treatment except for one major detail. They anxiously waited to make the final call on putting herbicides in the river until the results from our egg exposure and hatching experiments were in. Our experimental results suggested that snail eggs were less sensitive than juveniles. Eggs exposed to low levels of the herbicide, up to 20 times the typical hydrilla application rate, were just as likely to hatch as those that were not exposed to herbicide. With a sigh of relief, the task force moved forward with a pilot plan to treat hydrilla in the river for the next two summers. While we determined that the hydrilla was a greater threat to the river fauna than the herbicides, there was still the hurdle of figuring out whether control could be successful in a flowing river. The future of the Eno River’s fauna still hung in the balance of human intervention. The task force needed to be successful to beat another of hydrilla’s weapons: its underground reserves. Even with successful control, ridding a water body of hydrilla is very difficult, and it takes about seven years to exhaust its underground reserve of tubers, which act like little potatoes that can sprout new stalks. While there were some engineering kinks to work out, the first season’s herbicide application results were an early sign of success. The Eno River Hydrilla Management Task Force is now in the fourth season of hydrilla control in the river. 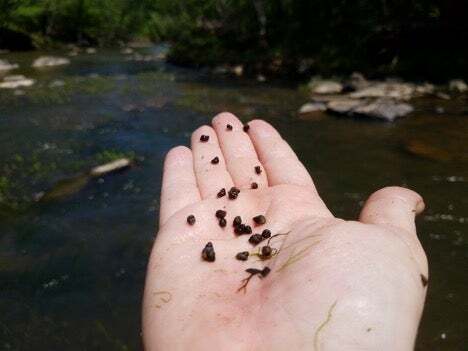 The N.C. Wildlife Resources Commission and State Parks staff are keeping a vigilant watch on the river’s fauna, the hydrilla is getting thinner each year, and my recent visit to the Eno confirmed that pebblesnails were present and breeding. My toxicology work is done here, and the snails are living well right now, but people must remain a strong part of this equation for a long time to come. Often what comes to mind when we think of herbicides and rivers are the environmental hazard warnings on lawn care product labels. Rarely, if ever, are we thinking about chemicals specifically designed for and purposefully applied directly to aquatic systems to control invasive plants in the water. In this case, herbicides were the most promising defenders of native species and their habitats. Though the crop of hydrilla in the Eno River is waning, more of the weed lurks in the watershed upstream of snail habitat in private and municipal ponds. 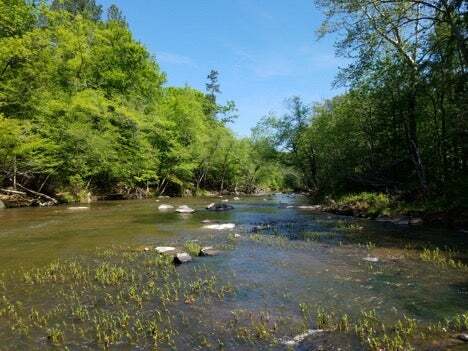 It’s going to take continued teamwork by scientists, municipal leaders, state agencies, private industry and local citizens to improve the watershed and keep the panhandle pebblesnail and the rest of the Eno River’s flora and fauna safe from this invader. Jennifer Archambault is a PhD Candidate in the Department of Applied Ecology at NC State University. She currently works in the aquatic toxicology research lab of W. Gregory Cope. 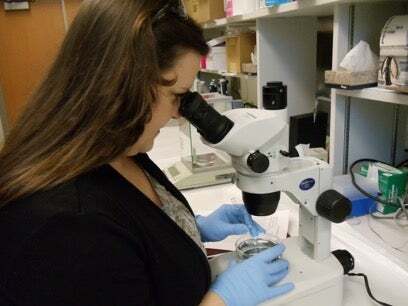 Her dissertation research is on the environmental/human health benefits provided by freshwater mussel populations as they maintain and improve water quality with their filter-feeding ecology.